The Panasonic Lumix DMC-GH2 is a new Micro Four Thirds compact system camera with a 16 megapixel multi-aspect Live MOS sensor and Full 1080p HD video with continuous autofocus at variable frame rates, including cine standard 24fps. Successor to the DMC-GH1 model, the GH2 also features extremely fast contrast-detect autofocus, a touchscreen control system with touch-based functions like Touch AF/AE and Touch Shutter, upgraded Venus Engine FHD processor, faster 60fps Live View, a multi-aspect electronic viewfinder, a 3-inch swivelling and tilting LCD screen, Optical Image Stabilisation to help combat camera-shake, ISO range of 160-12800, and a Supersonic Wave Filter to remove unwanted dust. 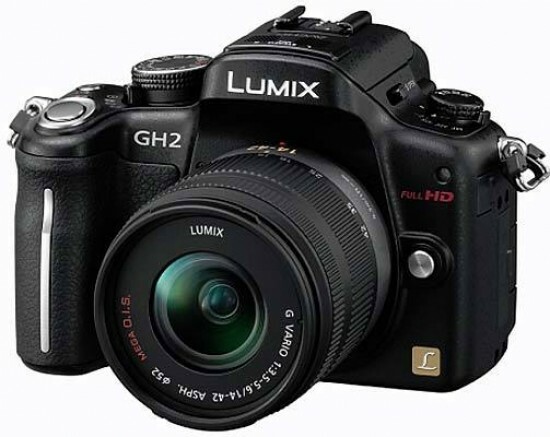 The Panasonic Lumix DMC-GH2 comes in black or two-tone black/grey and costs £899.99 / $1000 with the 14-42mm lens and £1299.99 / $1500 with the 14-140mm lens. In the US it's also available body-only for $900. In terms of its overall design and handling the new GH2 is virtually identical to the previous GH1 model, so a lot of the comments that we made about that camera will be repeated here. Measuring 124 x 89.6 x 75.8mm and weighing 392g without a lens attached, it's the same size and weight as the GH1. Panasonic have resisted the temptation to shrink the DMC-GH2 and make it as small as possible in order to ensure that users with average-sized hands can still operate it comfortably. On the front of the Panasonic Lumix DMC-GH2 is a small focus-assist and self-timer indicator lamp, lens release button, lens mount, and rubberised hand-grip. I naturally gripped the camera with the thumb, middle and fourth finger of my right hand, whilst operating the shutter button with my fore-finger and supporting either the lens or camera body with my left hand. The GH1's rubber compound coating has been replaced with a textured finish to the GH2's plastic shell, which is still a hard-wearing, protective coating and makes it easy to grip, but is a little less tactile and plain unusual than the GH1. Overall the DMC-GH2 continues the usual Panasonic approach of being extremely well-built, with a high quality metal chassis, lens mount and tripod socket. 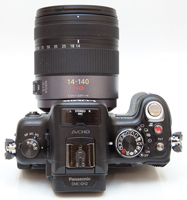 The GH2 only ships with either the 14-42mm or the 14-140mm kit lenses - there is currently no body-only option. 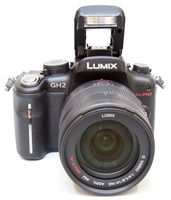 We predominantly reviewed the GH2 with the 14-140mm lens. While the body of the GH2 is comparable in size and weight to other DSLR cameras, the lenses are where Panasonic have really shrunk the overall system. Given the 10x focal length on offer, the 14-140mm optic is relatively small and light, although it is actually heavier than the GH2 itself. The lens does extend a long way when zoomed to its maximum telephoto setting, making it a little conspicuous, but that's a small price to pay for such an overall compact package. The real downside from a specification point of view are the relatively slow maximum apertures of f/4-5.6, which limits the GH2's use in low-light conditions and makes it more difficult to effectively blur the background to help emphasise the main subject. With the system now being well established, there are quite a lot of other Micro Four Thirds lenses currently available covering virtually every imaginable focal length. You can also use regular Four Thirds lenses or even Leica D lenses via optional adapters, but lenses that are not compatible with the GH2's Contrast AF function can only be used with manual focusing and cannot use the Tracking AF, AFc (Auto Focus Continuous) or Continuous AF functions. Unlike a conventional DSLR camera which uses a phase detection auto-focus system, the DMC-GH2 employs the same Contrast AF that is commonly used by compact cameras. As with the EVF, experienced photographers will now be tutting loudly at the thought of having to use a traditionally slower system. In reality the GH2 actually has one of the fastest AF systems of any interchangeable lens camera, be that a compact system camera or a DSLR - with certain lenses (the 14-140mm included) it can lock focus as quickly as 0.1 second! This is incredibly quick, and there were also almost no occasions when the GH2 failed to lock onto the subject, especially when using the centre AF point, resulting in a very quick and importantly reliable AF system. There are a wide range of AF modes on offer, including multiple-area AF with up to 23 focus areas, 1-area AF with a selectable focus area, Face Detection, and AF Tracking. The GH2 also has a useful Quick AF function that begins focusing as soon as you point the camera. Optical image stabilisation is supplied via the lens, rather than being built-in to the camera body. It can be turned on and off via the Mega O.I.S switch on the lens barrel, with three different modes accessible through the DMC-GH2's menu system. When enabled, the Panasonic Lumix DMC-GH2 automatically compensates for camera shake, which is a slight blurring of the image that typically occurs at slow shutter speeds when the camera is hand held. There are three different modes, Mode 1 is on all the time including image composition, Mode 2 is only on when you press the shutter button, and Mode 3 compensates for up and down movements only (which in turn allows you to pan the camera). In practice I found that it does make a noticeable difference. You don't notice that the camera is actually doing anything different when anti-shake is turned on, just that you can use slower shutter speeds than normal and still take sharp photos. Thankfully leaving the anti-shake system on didn't negatively affect the battery life, with the camera managing more than 300 shots or 120 minutes recording time capacity using the supplied rechargeable Li-ion battery, a slight improvement on the GH1's battery life. The GH2 has a different image sensor to the GH1, utilising a new multi-aspect 18.31 megapixel sensor that provides 16.05 effective megapixels. This is both to accommodate the movie recording functionality, and also to offer four different aspect ratios for still photos (4:3, 3:2 and 16:9 and 1:1 square modes) without affecting the angle-of-view by cropping or interpolation. Found on top of the Panasonic DMC-GH2 are the combined Focus mode dial and Focus Area switch, external flash hotshoe and built-in pop-up flash, large internal stereo mic, burst mode/bracketing/self-timer switch, on/off switch, and large tactile shutter button. There's also a traditional dial that lets you choose the different exposure modes. The usual selection of Program, Aperture Priority, Shutter Priority, and Manual are available for the more experienced photographers. This dial is a typical feature of SLR cameras, and enables you to quickly change between the various modes. The more beginner-friendly Scene modes are also accessed via this dial. Additionally there are 3 custom modes, marked C1, C2 and C3, which allow you to configure your favourite settings and quickly access them, and a My Color mode which sets the brightness, saturation and color of the image before you take it. The clever Intelligent Auto mode tries to make things as easy as possible for the complete beginner, allowing you to point and shoot the camera without having to worry about choosing the right scene mode or settings. Intelligent Auto Mode automatically determines a number of key criteria when taking a picture, including selecting the most appropriate scene mode (from 5 commonly used presets) and ISO speed, and turning face detection (up to 15 faces), image stabilization and quick auto-focus on. The Intelligent Auto Mode also includes Intelligent Exposure, which increases exposure only in the under-exposed areas of the image, Digital Red-eye, which automatically detects and removes red-eye, and AF Tracking, which continually tracks a moving subject and keeps it in focus, without you having to hold the shutter button halfway down as on most other cameras. Intelligent D-range continually checks the ambient light level and adjusts the exposure setting as conditions change to prevent blown highlights and blocked shadows, while Intelligent Resolution mode makes a standard image look like a higher resolution one. In practice the Intelligent Auto Mode system works very well, with the GH2 seamlessly choosing the most appropriate combination of settings for the current situation. The 5 available scene modes are Portrait, Landscape, Macro, Night Portrait and Night Scenery, so obviously not all situations are covered by Intelligent Auto Mode, but it does work for the majority of the time. It makes it possible for the less experienced photographer to easily take well-exposed, sharp pictures of people, scenery and close-ups by simply pointing and shooting the camera. Also catering for the beginner are a total of 11 different scene modes, including the new Peripheral Defocus mode, which despite sounding rather complicated makes it easy for beginners to achieve a blurred background / sharp subject effect without having to understand what apertures are. Also on the top of the camera is the Function 1 button, which as with the other two Function buttons on the navigation pad can be configured to activate one of 18 key settings, allowing the camera to be customised to suit your way of working, and the relocated Motion Picture button. As you'd expect, it allows you to start recording a movie with a single push of a button, and then stop recording by pressing the same button, regardless of which shooting mode is currently selected. This is a lot more intuitive than having to select the movie mode then press the shutter button, as on most cameras, and is more logically positioned than on the rear of the camera as per the GH1. The DMC-GH2 can record high-resolution Full 1080p HD 1920 x 1080 movies at 24 frames per second, Full 1080i HD 1920 x 1080 movies at 60 frames per second, and 720p HD 1280 x 720 movies at 60 fps, all in the AVCHD (MPEG-4/H.264) format. In addition it can also record Motion JPEG movies at 320 x 240 at 30fps, 640 x 480 at 30fps, 848 x 480 at 30fps and 1280 x 720 at 30fps, useful as this format can currently be shared more easily. AVCHD features almost double the recording time in HD quality compared with Motion JPEG, but software support is still a little thin on the ground. Panasonic describe it as the best mode for playing back on a HD TV direct from the camera, and Motion JPEG best for email and playing on a computer. There is a limit on the length of a movie of up to 29 min 59 sec in European PAL areas, and continuous recording exceeding 2GB is not possible when recording in the motion JPEG format. The Creative Movie shooting mode, accessed via the mode dial on top of the GH2, allows you to set the shutter speed, aperture or both settings manually during recording (a Program option is also available). Changing the shutter speed is especially suitable for shooting fast-moving subjects, whilst the ability to control the aperture is convenient when there are several subjects at different distances. In practice this system works well, allowing some really creative effects, but there are a couple of drawbacks. Firstly the operating sound of the control dial is very audible in the movie, so you'll need to edit the soundtrack later to remove it. Secondly, you can't set the shutter speed to below 1/25 second, instantly ruling out more creative slow shutter-speed effects. The new 24P Cinema mode adds a rich, cinema-like gradation to your movies, while the Variable Movie mode allows the frame rate of the movie to be slowed down or speeded up (-80%, +160%, +200%, +300%). Available for both JPEG photos and movies, the new EX Tele Conversion option extends the zoom by 2.6x beyond its original limit to get the subject even closer, providing a maximum focal length of 728mm in FSH mode, 1092mm in SH / HD / WVGA modes, and 1344mm in VGA / QVGA modes. In movie mode it does this by only using the central 2 megapixels of the GH2's 18.3 megapixel sensor, which is roughly equivalent to a 1920x1080 pixels movie, and subsequently there is less loss of image quality as the camera doesn't have to digitally reduce the sensor output from 18 to 2 megapixels. The DMC-GH2 can also take a 14 megapixel photo in the 16:9 ratio whilst recording a movie, and you can save a specific frame of a movie as a still image during playback. The Panasonic GH2's Intelligent Auto mode also works in movies as well as for still photos. Simply select the Movie icon on the mode dial and press the iA button. The Intelligent Scene Selector automatically determines the most suitable Scene mode from five options - Portrait, Scenery, Low Light and Close-up or Normal modes. Face Detection automatically detects a face in the frame and adjusts the focus, exposure, contrast, and skin complexion. Intelligent Exposure continually checks the ambient light level and adjusts the exposure setting as conditions change to prevent blown highlights and blocked shadows. The Optical Image Stabilizer helps prevent blurring from hand-shake when using a compatible lens. Stereo sound is recorded during video capture via the large internal mic on top of the camera, which is a big improvement on the rather muffled noises recorded by most digital cameras, helped by the wind cut function which blocks out most of the noise from background wind. You can also add an optional external stereo microphone (DMW-MS1) to enhance the sound further. The HDMI port allows you to connect the GH2 to a high-def TV set, but only if you purchase the optional HDMI mini-cable. You can use any zoom lens during recording with focusing set as for still images. On the negative side, you'll find that if you choose continuous auto-focus, areas of the video will be blurred before becoming sharp again as the camera tries to refocus. On a more positive note, the the GH2 is quite fast at re-focusing (although not as fast as for still images), and having this system is much better than not being able to auto-focus at all, as with most current DSLR cameras that offer video recording. Hand-holding the GH2 during movie recording inevitably leads to obvious shake, despite the optical image stabilizer on compatible lenses, so for best results you'll need a dedicated video tripod. One cool benefit of the touch-screen control system is that Touch Auto Focusing is available in movie recording, enabling pro-level rack-like focusing simply by pointing at the subject on the LCD screen. The rear of the Lumix DMC-GH2 is dominated by the large 3 inch LCD screen with 100% scene coverage. The rotating, free-angle LCD monitor, which is hinged on the left side of the camera (looking from the rear), can be flipped out and twisted through 270 degrees. You can use the screen as a waist-level viewfinder, holding the camera overhead, and even for turning the GH2 on yourself for arm-length self-portraits. There's also the added benefit of folding the screen away against the camera body to protect it when stored in a camera bag, preventing it from becoming marked or scratched. The 460K pixel, high-resolution screen coped admirably with the majority of lighting conditions. This screen is a great improvement on cameras with the usual 230K dot resolution, even being nice to use in low-light. The Auto Power LCD function automatically detects the current lighting conditions and boosts the LCD backlighting by up to 40% when shooting outdoors in bright sunshine, helping to keep the screen visible. The high-res, free-angle LCD screen is much more than just a novelty - it's a lot more versatile than the usual combination of optical viewfinder and fixed LCD, providing new angles of view and enhancing your overall creativity. Above all, it's a fun way of composing your images. One of the major additions to the GH2 is its touchscreen interface. Panasonic have wisely restricted the amount of things that you can do by interacting with the LCD screen, and indeed you can still operate everything on the camera without having to push and prod the LCD at all. But you would be missing out on a lot of genuinely useful functionality that really improves the shooting experience. 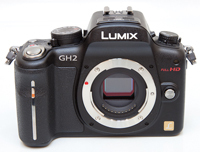 Instead of the bulky optical viewfinder of a conventional DSLR, the Panasonic GH2 has a smaller electronic viewfinder. The mere mention of an EVF is usually enough to elicit loud groans from any serious photographer, as they have traditionally been poorly implemented in the past, with low-res, grainy displays that were only really suitable for still subjects. Thankfully the electronic viewfinder on the GH2 is far better than any previous system. It has a large 1.42x (0.71x on 35mm equiv.) magnification, 100% field of view, 1,533,600 dot equivalent resolution, and 852 x 600 pixels to match all of the multi-aspect ratios, resulting in a very usable display that won't leave you cursing. The EVF (and also the main LCD screen) operates at a native rate of 60fps, twice the usual speed, which helps make it more flicker-free than the GH1, which interpolated its 24fps signal and displayed it at 60hz. As the EVF is reading the same signal from the image sensor as the rear LCD screen, it can also display similar information - for example, you can view and operate the GH2's Quick Menu, giving quick access to all the key camera settings while it's held up to your eye. The various icons used to represent the camera settings are clear and legible. The icing on the viewing cake is the clever built-in eye sensor, which automatically switches on the viewfinder when you look into it, then switches it off and turns on the LCD monitor when you look away. The electronic viewfinder on the GH2 is the equal of and in many areas better than a DSLR's optical viewfinder, particularly those found on entry-level models which are typically dim and offer limited scene coverage. The truest testament to the GH2 is that I mostly used it by holding it up to eye-level, something that I wouldn't do unless the EVF was of sufficient quality. On the rear of the Panasonic Lumix DMC-GH2, from left to right, is an LVF/LCD button for manually switching between the two viewing methods (useful if you turn the eye sensor off), a Playback button, conveniently located AF/AE Lock button, and a control dial. This is used for, amongst other things, changing the aperture and shutter speed by turning from left to right and back again. As with the shooting mode dial, this is a common feature found on DSLR cameras, so you'll be right at home if you've used any DSLR before - compact camera users will need to get used to using this dial, although it is possible (but rather long-winded) to set the aperture/shutter speed via the LCD screen. The control dial can also be pressed in to switch to setting the exposure compensation, which can now be set in ±5 steps. Next are the Quick Menu and Display buttons. In shooting mode, the Display button alternates between turning the display off, the main camera settings as icons, no settings at all, and an improved Info Display which shows the current key settings in a clear graphical format. You can additionally press the Q.Menu button and then use the navigation pad to move between the onscreen options. The Q.Menu button provides quick access to most of the principal controls, including ISO speed, image size, image quality and white balance (there are 16 settings in total, depending upon the shooting mode selected). You can still access all of these options from the main menu system too. The GH2 has a traditional 4-way navigation pad system with a Menu/Set button in the centre. Pressing up, right, down, and left on the D-Pad buttons selects ISO speed, White Balance, and the Function 3 and Function 2 options respectively. The Function buttons can be configured to activate one of 18 key settings, allowing the camera to be customised to suit your way of working. The Delete button underneath the navigation pad intriguingly has a second function - it doubles up as the Preview button. This very cleverly toggles between showing a live preview of the effects of the current aperture (effectively a digital version of Depth of Field Preview) and the current shutter speed. The latter will prove especially useful for beginners, providing a visible way of checking how different shutter speeds will affect the capture of different subjects - running water is a good example. The main menu system on the DMC-GH2 is straight-forward to use and is accessed by pressing the Menu/Set button in the middle of the navigation D-Pad. There are six main menus, Record, Motion Picture, Custom, Setup, My Menu and Playback. Most of the camera's main options, such as white balance, image quality, auto-focus mode and ISO speed, are accessed here, so the Record menu has 22 options spread over 5 screens, the Motion Picture menu has 14 options over 3 screens, and the Setup menu has 23 options over 5 screens. As an indication of how configurable the GH2 is, the Custom menu has 35 different options, allowing you fine-tune this camera to suit your way of working. The Panasonic Lumix DMC-GH2's Intelligent Resolution mode makes a standard image look like a higher resolution one by processing the contour areas, texture areas and smooth areas individually. There are three available strengths - low, standard and high. Despite all the clever behind-the-scenes processing, it's fairly easy to tell which image was taken with Intelligent Resolution turned on and which one with it turned off due to unwanted artifacts appearing, particularly if viewing onscreen at 100% magnification. While the difference isn't quite so apparent on a print up to A3 in size, I'm not convinced enough to recommend regularly using it. In a throwback to the days before digital took over the world, the top of the GH2 offers a range of Film Modes via the main menu, with 7 colour types and 3 types of monochrome to choose from. This applies to both JPEG and RAW files, so you can effectively shoot a black and white RAW file, for example, out of the camera if you wish (although I'm not sure why you'd want to...). As you select a different Film Mode, the effects can clearly be seen on the LCD screen. In addition, you can change the contrast, sharpness, noise reduction and saturation levels for each one, and even create 2 custom modes of your own. The Multi Film option takes up to three consecutive images using different Film Mode settings (this doesn't work in RAW mode though). As mentioned previously, the inclusion of the Q.Menu button on the rear of the camera speeds up access to some of the more commonly used options. Due to the large LCD screen and restricting the number of on-screen choices to five, the various options and icons are clear and legible. If you have never used a digital camera before, or you're upgrading from a more basic model, reading the easy-to-follow manual before you start is a good idea. Thankfully Panasonic have chosen to supply it in printed format, rather than as a PDF on a CD, so you can also carry it with you for easy reference. On the bottom of the Panasonic DMC-GH2 is a metal tripod socket, importantly in-line with the middle of the lens barrel, and the battery compartment, and on the right side is the SD/SDHC/SDXC memory card slot. 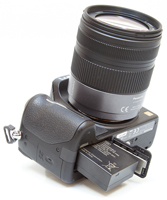 On the left is the Remote/Mic socket for use with the optional remote shutter release or external microphone, and two connection ports, including a HDMI port for connecting the GH2 to a HD television or monitor. Unfortunately, Panasonic have decided to cut costs and not include a HDMI cable as standard in the box, which means that you'll have to purchase one separately to take advantage of this camera's HD connectivity. The start-up time from turning the Lumix DMC-GH2 on to being ready to take a photo is impressively at around 1 second. The Contrast Auto-Focusing system is amazingly quick in good light and the camera achieves focus almost all of the time indoors or in low-light situations, helped by the AF assist lamp. The GH2 also doesn't have any notable problems locking onto the subject in low-light situations. The visibility and refresh rate of the 3 inch LCD screen are very good, and the pixel count of 460,000 dots is also good, with virtually no visible grain. It takes about 1 second to store a JPEG image, allowing you to keep shooting as they are being recorded onto the memory card - there is a barely perceptible LCD blackout between each image. Storing a single RAW image takes around 5 seconds, but thankfully it doesn't lock up the camera in any way - you can use the menu system or shoot another image while the first file is being written to memory. The Panasonic Lumix DMC-GH2 has a fast Burst mode which enables you to take 5 frames per second for an unlimited number of JPEG images at the highest image quality, or 7 RAW images. A higher-speed burst rate of 40 fps at 4 megapixel resolution is also available (the DMC-GH2 uses its electronic shutter to achieve this rate). Once you have captured a photo, the Panasonic Lumix DMC-GH2 has an average range of options when it comes to playing, reviewing and managing your images. You can instantly scroll through the images that you have taken, view thumbnails (up to 30 onscreen at the same time and in a Calendar view), zoom in and out up to 16x magnification, view slideshows, delete, protect, trim, resize, copy and rotate an image. You can also select favourite images, change an image's aspect ratio, add a sound clip to an image, delete Face Recognition data, and set the print order. The Display button toggles detailed settings information about each picture on and off, such as the ISO rating and aperture / shutter speed, and there is a small brightness histogram available during shooting and RGBY histogram during playback.